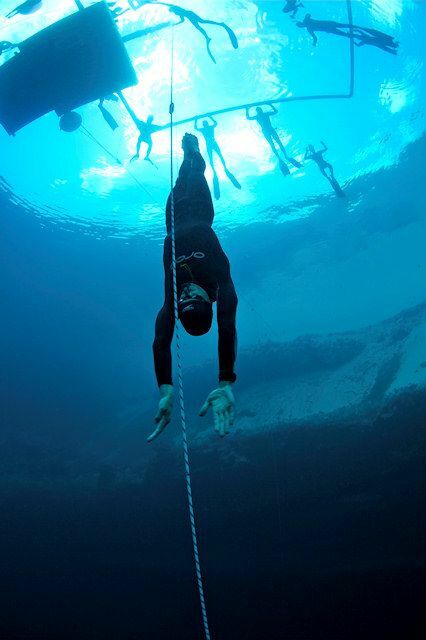 Competition freediving involves diving the deepest, furthest, or longest on a single breath. There are six disciplines – three pool-based, and three depth. Dynamic (DYN) & Dynamic No Fins (DNF): The diver swims as far as possible doing laps underwater in a pool on one breath. Static (STA): The diver floats on the surface with their airway submerged for as long as possible. Constant Weight (CWT) & Constant Weight No Fins (CNF): The diver swims down, following a rope, to their announced depth and retrieves a tag, then swims back to the surface. Free Immersion (FIM): The diver pulls themselves down the rope to collect the tag and then back to the surface. A diver must be able to complete a surface protocol (removing mask/goggles, signalling, and saying “I’m OK”) within 15 seconds of finishing the dive to show that they are still fully conscious and aware. If they do not, in the interest of safety the diver is disqualified. This is to encourage divers to stay within their limits. Further description of the disciplines can be found on the AIDA International website which also lists the Rules and Regulations for competition.